Taking David Tennant out of the Tardis and into Hamlet is a leap in the dark even for a time traveller, director Gregory Doran tells Hermione Hoby. With a string of acclaimed productions behind him, the RSC's chief associate director Gregory Doran has finally turned his attention to Shakespeare's most challenging play. And with David Tennant in the title role it's no wonder that the production of Hamlet, opening at Stratford's Courtyard Theatre (until 15 November), is proving to be this summer's hottest ticket. What drew you to directing Hamlet? I've always been rather intimidated by Hamlet. It's the most revered play in the canon. People regard it as a great thriller, or a psychological drama, or a piece of dark, political metaphor. I realised you can't see it as any one of those, because the play contains them all. There's no such thing as a definitive production but it is defined to some extent by who you have as Hamlet. What made you cast David Tennant in the title role? A good idea for a Shakespeare tends to fire on several cylinders; one of them is the actor and one of them is the timing. I was watching Meet the Ancestors and saw David in this church wearing a black greatcoat and he picked up a skull. I texted him and said, 'Saw your audition for Hamlet on the telly'. The two parts he really wanted to play were Hamlet and Berowne in Love's Labour's Lost, which were the two plays I had just come round to thinking of doing. He's known as a gloomy Dane but Hamlet says, 'I have of late lost all my mirth', which suggests that actually, generally speaking he's a funny guy. Will this be a funny Hamlet? Yes! Some of the wit in the play is very surprising and it gets a lot of laughs. 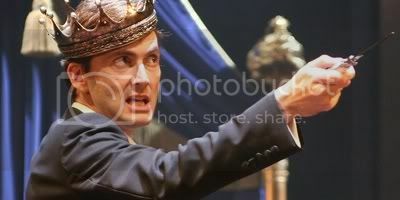 And David is particularly good at that element of Hamlet's character. I was aware some of the audience were probably coming to Shakespeare for the first time and I felt a great responsibility. In doing Hamlet you have to respond to the world around you. That's the thing about Shakespeare - he just attracts what's happening in the world like iron filings. I have to confess that apart from the episode where he discovers the lost Shakespeare play, I haven't watched it. It's the same with Patrick Stewart as Claudius - I wasn't a great Star Trek fan! The phenomenon of Dr Who is extraordinary. In the fish'n'chip shop here they've put a Dalek in the window saying, 'Exterminate your hunger'. Are you and David feeling stressed? Doing these big plays you frankly ought to be under pressure. The sheer act of getting through five acts of Shakespeare requires such muscularity. Another celebrity wouldn't get through it but David's doing an incredible job. But no matter how much the audience enjoy it, it will be defined by what the critics say. It's a hall of mirrors.